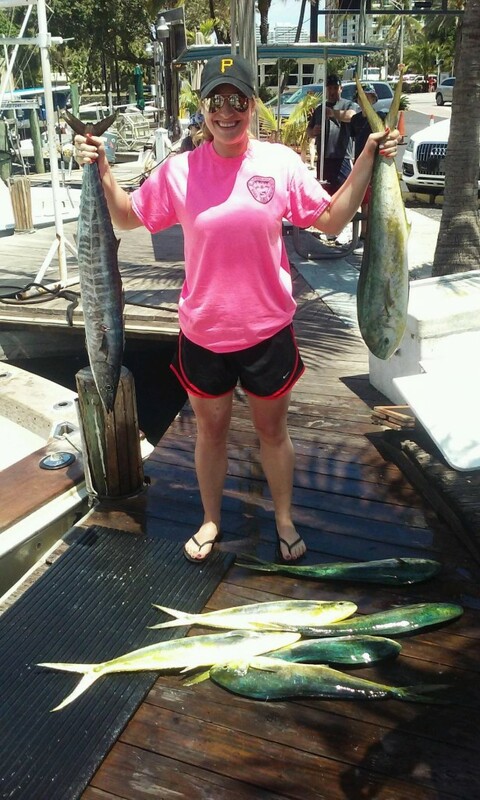 Nice catch of dolphins on our sportfishing charter. The dolphin bite happening offshore of Fort Lauderdale this year is outta this world and the best I have seen in many years. So many of our trips are coming in with unforgettable dolphin catches these past couple weeks. The dolphin are scattered in anywhere from 200ft to 800ft of water offshore of Ft Lauderdale. They are hanging near any kind of weedline or scattered debris you can find floating out there. Our most successful fishing trips have been made by trolling artificial and rigged dead baits on the surface, trolling pretty fast and trying to cover as much territory as we can. This is the most efficient way to fish dolphin as you need to ‘put in the miles’ to find them. You still don’t catch them every trip. I don’t want to make it seem like you can go out and catch these dolphin on demand with no effort involved. You need to go out trolling, cover a ton of territory, use every fishing trick you know and then still get lucky to catch them. Fortunately, we always do this no matter what the conditions, so when the fish are actually present and biting, it makes it looks just plain easy! 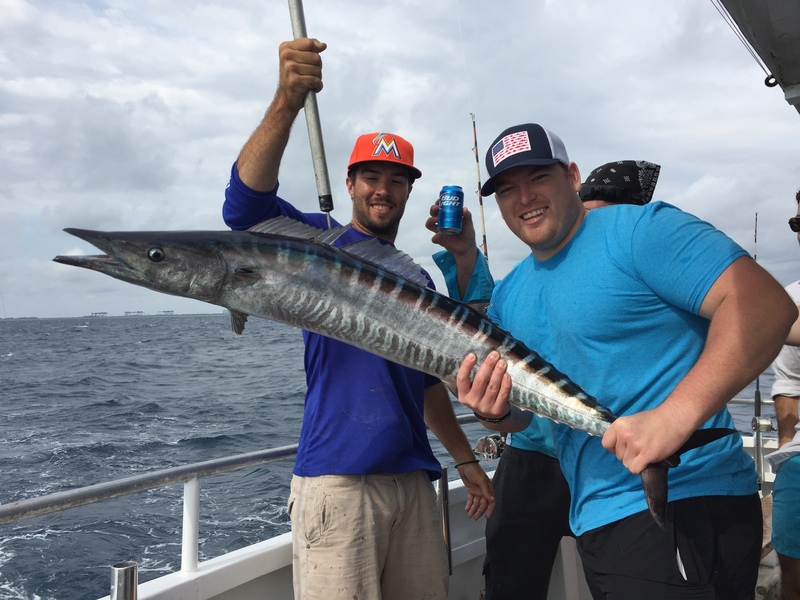 The wahoo and tuna are biting pretty decent out there too. They travel in the same waters as mahi-mahi so it only makes sense that we’re getting into some of them as well. Wahoo like to hang around any kind of floating debris, so when we find a nice hunk of wood floating, we know we’ve hit the honey hole. Wahoo also bite very good around both the full and the new moon phases, right on the reef. Tunas are hungry and voracious feeders. They eat constantly so you will find them around anywhere where there are masses of small baitfish. The birds are the best method to find tuna and a savvy captain and troll near the tuna schools without getting too close and scarring them deep. Tunas are skittish, so you need to give them a wide berth when trolling the outskirts of the school. If you are too far away, you won’t get the bite but if you are too close, you’ll scare the school deep. It’s a fine line, but we can usually get near enough to catch them. With tunas and wahoo mixed in, our dolphin catches are even better. Kingfish, barracuda, sailfish and more are also being caught trolling the reef and inside edge of the Gulfstream. We’re getting them here and there, about average for this time of year. Dolphin are the most desirable for their supreme edibility though, so all other fish take a back seat to them. Wreck fishing is particularly good this month. Amberjacks, grouper, cobia and sharks are all inhabitants of our local shipwrecks and all of these are biting strong this time of year. We’re only 4 days away from groupers coming back into season, so get ready for that! Monster sharks are taking advantage of the plethora of good eating big game fish around these wrecks, a prime hunting ground for these apex predators. Amberjacks are probably the strongest fish we catch, pound for pound, and are biting really good this month. If you want to try to get some quick action on some big game species, wreck fishing can be lucrative. Pull up on the up-current side of a shipwreck and drop a live bait down to the bottom. There are some sea monsters hanging around these wrecks. Amberjacks don’t leave a bait unmolested for any length of time. They feed on sight and instantly eat any baitfish that looks like an easy meal. 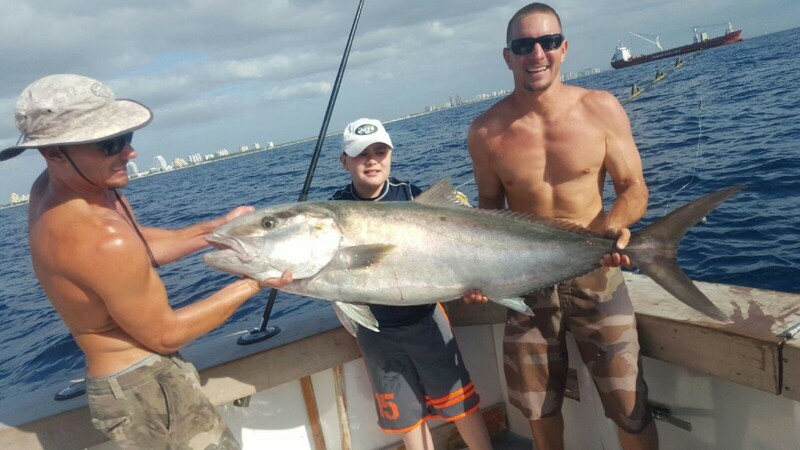 We have another month of the great amberjack fest around the local shipwrecks. 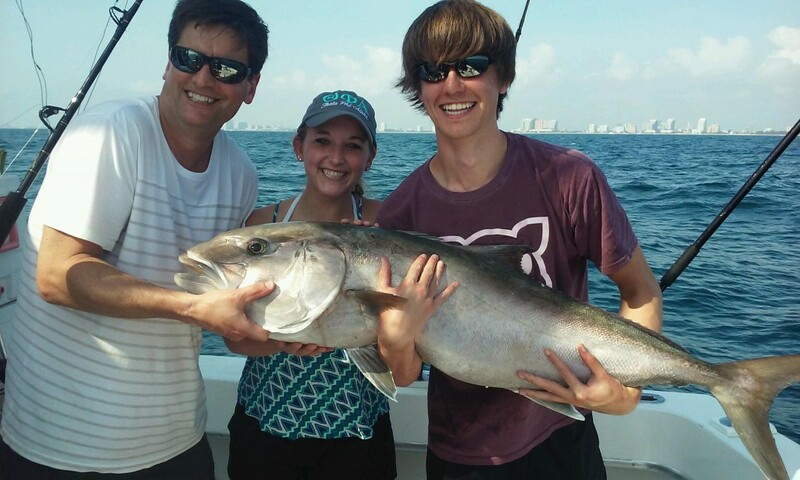 Huge amberjack caught by this young angler on our sportfishing charter in Ft Lauderdale. 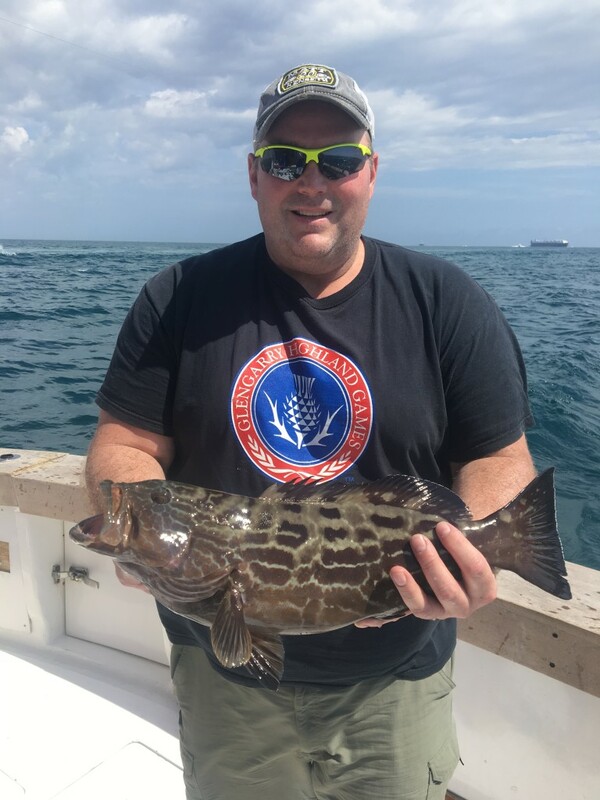 It’s a great month to come fishing in Fort Lauderdale so if you have a chance, this is the best time of year to fish in Fort Lauderdale. Just about everything is biting. We’re still at the mercy of how the fish cooperate with us, but most of our fishing charters do extremely well this time of year. You can’t ask for better potential on a half day charter. Grab the family and Let’s Go Fishing! 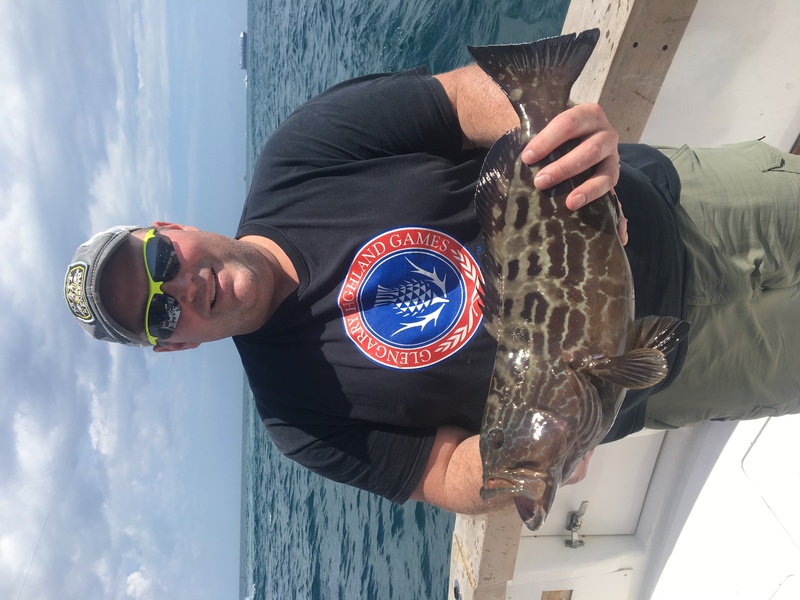 Nice grouper caught just before grouper season opens up. Huge bull dolphin caught on a family reunion fishing trip aboard Mary B 3. What a bite! 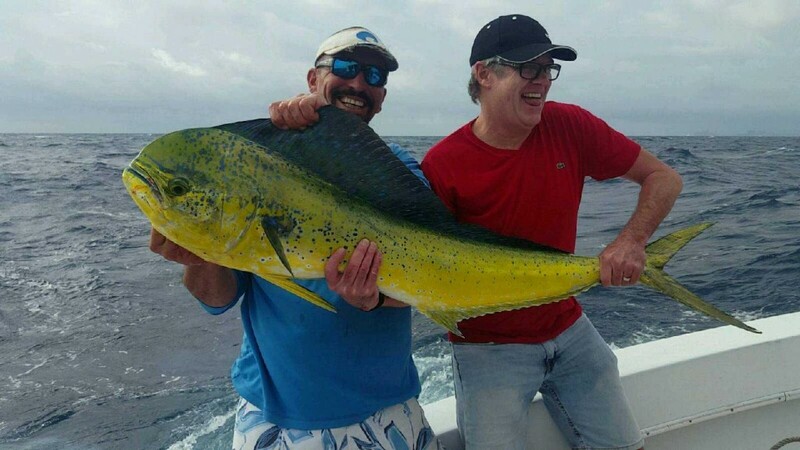 The dolphin fishing in Fort Lauderdale is going off this week. Big dolphin are showing up between 180-600ft offshore Fort Lauderdale. They are biting best on the strong east winds, days when the waters are rough and choppy. Trolling is the most effective way to target dolphin fish. Just start trolling around, covering different depths and zones until you find an area that looks ‘fishy’. Good indicators that you are in a good zone are: stacked up seaweed or other debris floating, a color or current change and the best indicator are the birds. Frigate birds are the best way to find the bigger dolphin. They have the bird’s-eye-view out there. Find the birds and find the fish. All our biggest dolphin this week were caught chasing the frigate birds around. 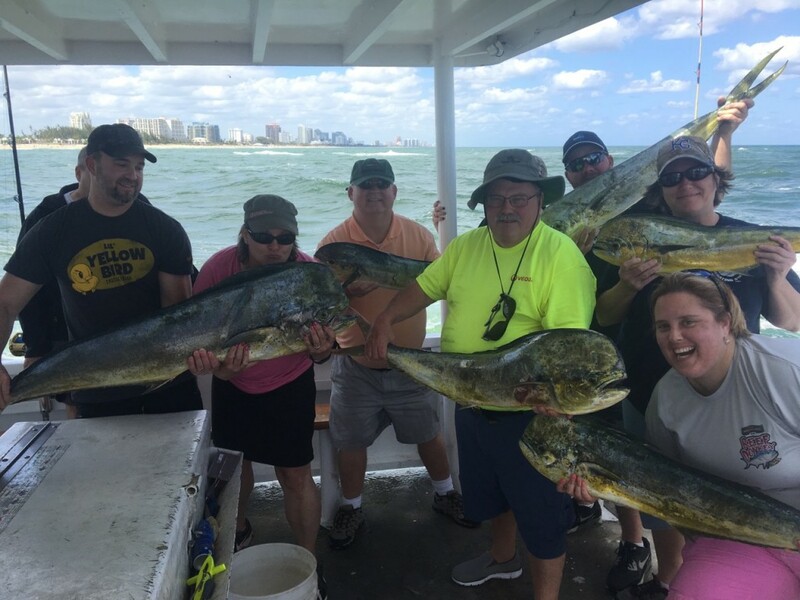 Awesome dolphin catch on a family fishing charter aboard Mary B III. The dolphin aren’t just jumping in the boat. You have to go looking for them and put in the time to be successful. Dolphin fishing is not action packed, in fact, it’s kind of slow fishing. Hours and hours without a bite, but when you do find them its the most fun, extreme action imaginable. A wise fisherman once said that dolphin fishing is hours of boredom interrupted by a moment of panic. 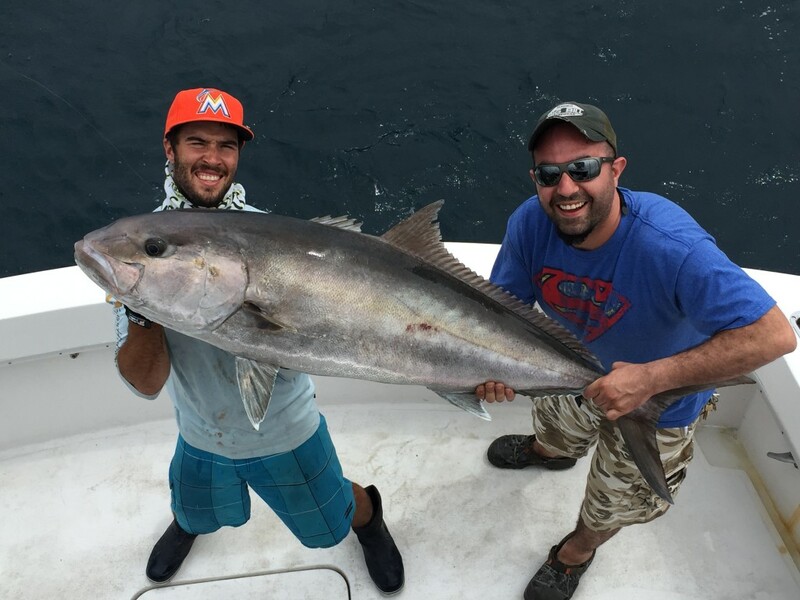 In you’re fishing Fort Lauderdale, start trolling about a mile offshore and head offshore. Keep note of where you see the best waters. Look for seaweed. Seaweed is the most identifiable clue that an area has good potential to hold fish. Seaweed stacks up along a current edge, known as a weedline, which is an extremely good zone to fish and a convenient ‘line’ to troll along. Large pelagic fish patrol weedlines because baitfish use the seaweed as cover and refuge to hide from predatory fish. Find the baitfish and the larger gamefish aren’t usually far behind. 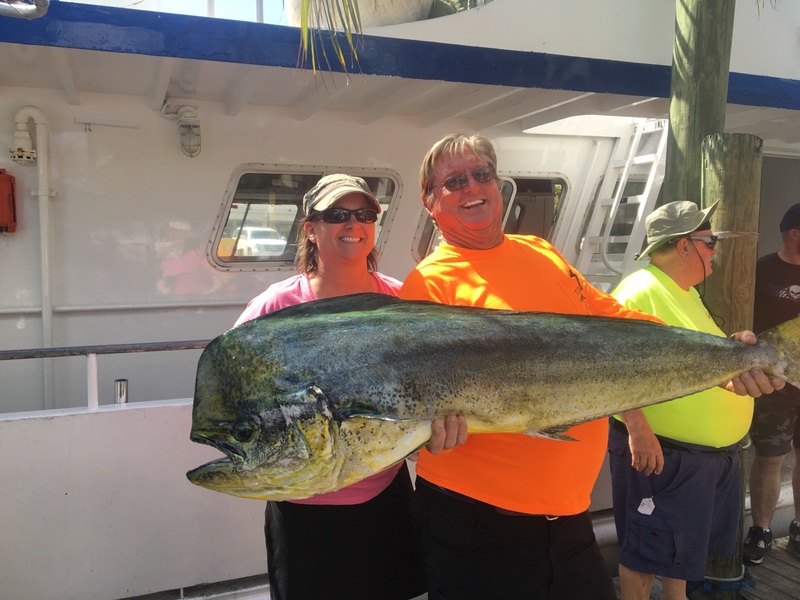 Nice mahi-mahi caught trolling on our sportfishing charter. Wreck fishing deserves a big mention in today’s report. Some of the biggest fish we’re catching these days, amberjacks and cobia, are hanging around our deep, sunken shipwrecks. These wrecks are havens for clouds of baitfish and you guessed it, big game predators. This is amberjack season and most of the wrecks have a slew of big jacks hanging out waiting for a disoriented baitfish to swim past. Barracudas, cobia, sharks and more also hunt near these shipwrecks. Any wreck in 200-400ft of water is likely to have some big fish in the area. On our fishing charters, we like to go ‘wreck hopping’. This is a technique where we go to a shipwreck, drop a live bait down to the bottom and give it a couple minutes. If we get a bite, we fish it more. If no bite in a couple minutes, we wind it up and go try a different spot. We don’t fish any particular spot very long because the bigger bottom fish (the ones we are after) are aggressive feeders. This is a fast paced, good method to hit a bunch of wrecks if you’re out on a half day charter. Sharks are still biting strong too. The migration of big hammerheads, dusky, thresher, mako and bull sharks is happening now. We’re about a month into the shark season and we have another 2 months to go. 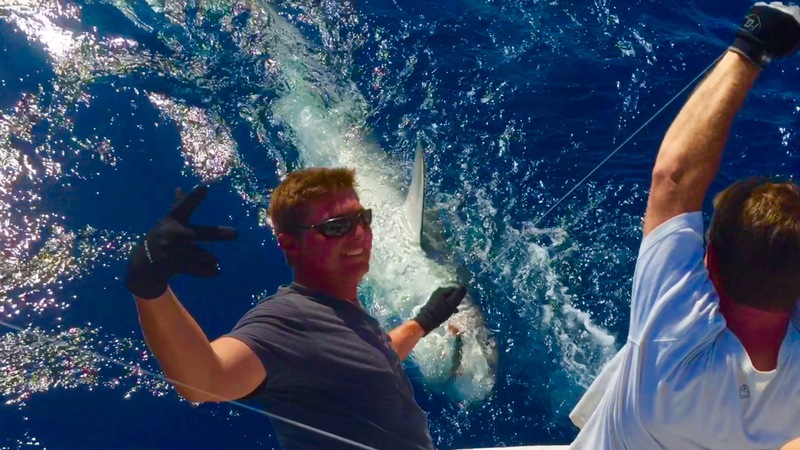 Shark fishing off the coast of Fort Lauderdale is EPIC. Some of the biggest sea monsters able to be caught on rod and reel swim right past our coast. There is a lot of available food here this season. They are here and they are hungry, so if you want to catch a giant gamefish, there’s nothing larger and more exciting to be caught than a mammoth gameshark. All in all, this is the hottest fishing season of the year for south Florida. Come out on a fishing charter with us and let’s see if we can’t catch you a memory to last a lifetime. I’ll sea ya on the water! 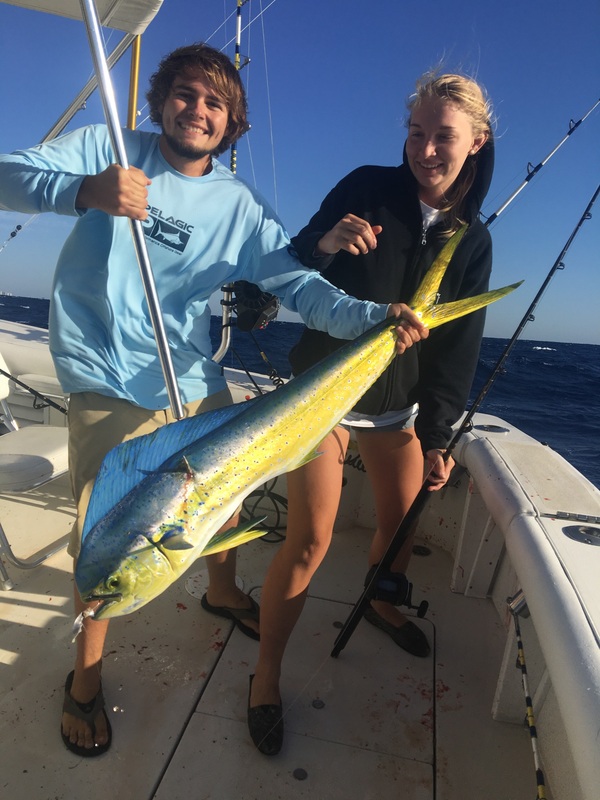 Nice dolphin caught on our Fort Lauderdale fishing charter. 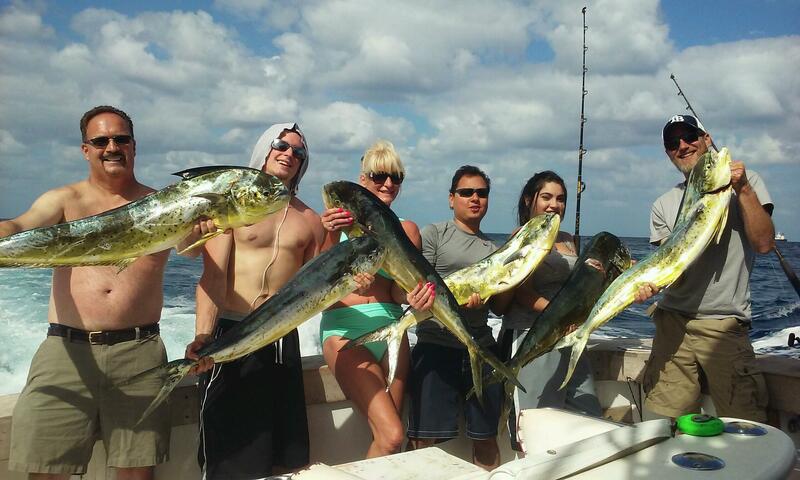 Some very good catches are showing up on the Fort Lauderdale reefs and wrecks this week. We are right in the heart of the best fishing season of the year for south Florida and all the fish are arriving ‘on schedule’. Huge jacks, and lots of them, are showing up around the shipwrecks. Amberjacks and almaco jacks are biting great and the sheer numbers of these hungry gamefish are creating a lot of competition for food. This competition makes for a very aggressive bite around the wrecks. Amberjacks are the most aggressive fish down there so they usually get the bait before anything else has a chance at it. But sometimes a lucky grouper, cobia or barracuda will grab it first. Needless to say, the bite on the wrecks happens quick! The trick is to pull the fish clear of the structure before it has a chance to wrap you up around the superstructure of the shipwreck. We use heavy tackle and a lot drag on the reel to power these fish clear of the shipwreck’s rigging. In April, wreck fishing is hot, fast and fun action. Trolling is good action too. The great thing about trolling is that you can cover a lot of territory and try different depths and areas. We can listed to the radio and hear what the other boats are catching. If we hear a good bite going on up to the north, we’re mobile and can head right there. If the best bite seems to be happening in 180ft of water today, we can concentrate our fishing efforts in that depth. Trolling is versatile and therefor usually produces the best overall catches. 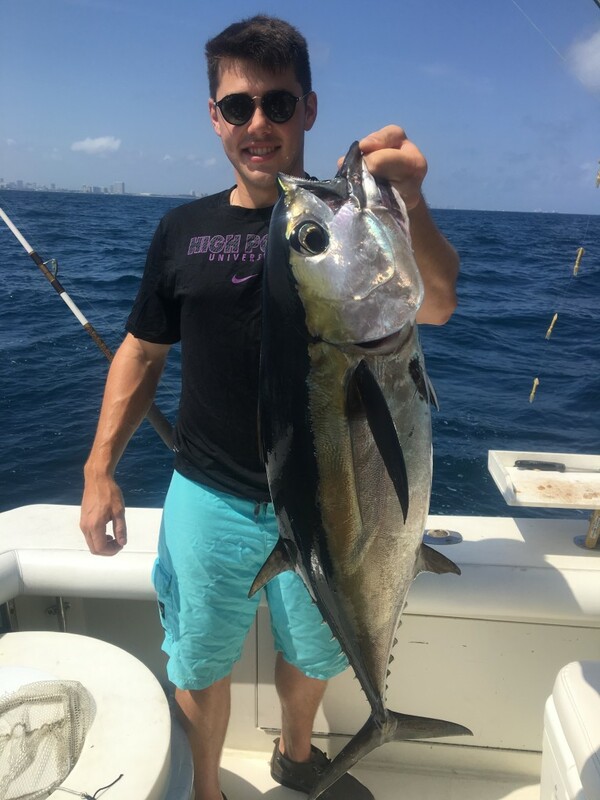 Dolphin, tuna, wahoo, kingfish, bonitos, barracuda and more are all fish that bite best on the troll. You never know what you might catch. Watch and wait for the hard east wind. Any strong wind out of the east will produce a stellar dolphin bite on the reef. Of course, these are the roughest days to fish, but to get the best fishing, you have to work for it. Any day/weather condition could produce a good bite but that hard east wind is as high-percentage as it gets. April is a great month for trolling. And that brings us to the biggest fish of the season, sharks and sailfish. It is the latter part of the sailfish season, but they are still biting. You’ve got until about the end of May for a good chance at sailfish. Winter is the best time to go sailfishing but being the most sought after gamefish in the sea, we fish for them all year long. Kite fishing is the best technique to fish for sailfish and other surface feeding gamefish. Which brings us to the biggest of the big game fish, shark fishing! March through May is the best season of the year to come shark fishing in south Florida. 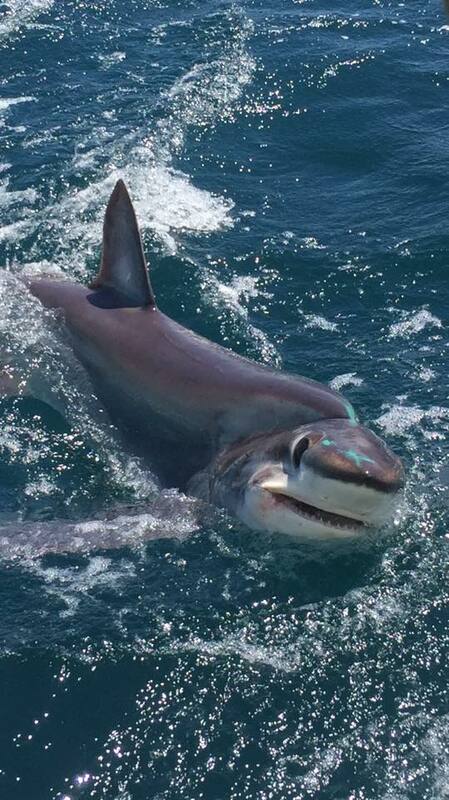 We do a lot of special fishing charters just for sharks. Over the next couple months, we have an epic migration of giant sharks through our waters. Hammerhead sharks are biting very good right now. Also there are some dusky, sand bar, thresher, bull and tiger sharks biting. If you’d like to catch the biggest fish of your life, this is the month to do it. Huge tiger shark caught on our sportfishing charter. We wait all year for the great fishing we have off the south Florida coast this month (and next). Just about everything is in season right now (except groupers), so the sky is the limit. The largest and most epic fish of the year are usually caught in April and May. If you’re a trophy hunter or you want to go after the biggest pelagic fish possible, this is the time of year you want to fish. Fort Lauderdale rarely has this concentration of big game fish moving through her waters. It’s always a fun time to come fishing, but it sure is a lot more fun when the fish are here. Good luck to everyone fishing over the next couple weeks. I’ll sea ya on the water.